Do you have the desire of working from the comfort of your own home, having a flexible schedule that feels freeing, and spending your days doing work you actually enjoy? Well, I may have the answer for you! Why not start a Virtual Assistant Business? Before we get started on how to start a Virtual Assistant Business that makes money, we would love for you to join our growing Facebook group right here! You can also join our Pinterest group by scrolling to the bottom of this page! If you are looking for guest blogging opportunities or if you need a personal affordable coach to take you from A-Z, we can help you. Get all the juicy details right here! Have you seen our brand new shop! Before I dive into what a virtual assistant is and the steps to take to become one, I want to share how I got started. I used to daydream about quitting my job and working from home. I tried making money in several different ways, like selling handmade jewelry on Etsy and in gift shops, but I wasn’t making enough money to justify quitting my job. Desperate and eager to figure things out, I emailed a business coach and offered to help her with her business tasks in exchange for coaching. To my surprise, she responded right away and was excited about the opportunity! I ended up enjoying the VA work, found more clients to work with, and quit my job 3 months after landing my first paying client! As soon as you start a Virtual Assistant Business, it is possible to earn a full-time income from home in no time. Ps: You can definitely start a Virtual Assistant Business with no experience. As in no prior experience, we will show you how to get the experience needed to land clients. Ready to learn more about what is involved in becoming a Virtual Assistant AKA a VA? A Virtual Assistant (VA) is basically someone who provides services remotely, which means they work from anywhere! Start a Virtual Assistant Business today and work from anywhere! This is the number one reason we decide to become a Virtual Assistant. What type of services does a virtual assistant do? What exactly is involved when you choose to start a Virtual Assistant Business? There’s a large variety of services you can offer as a VA. They can be administrative, creative, technical, or a mixture of any of these. Basically, if you have a specific skill, there’s probably someone willing to pay for it. The list is pretty much endless! This means there will be plenty of jobs that you can offer when you do start a Virtual Assistant Business. It also means you can pretty much a full-time income from home once you do become a Virtual Assistant. So, if you’re currently an Administrative Assistant, you could probably offer services similar to what you do at your job (that is if you like what you’re doing). If you’re a writer, you can write and edit blog posts, newsletters, ebooks, or social media content. If you’re creative you can offer graphic design or web design services. Starting a personal assistant business should not be complicated. Don’t have a specific skill set yet? There are tons of online courses to help you learn the skills you need to create the services you want to offer. Check out our subscription course where you can learn how to start a blog for profit. It is a comprehensive guide that teaches you how to start a blog that makes actual money. Online and offline businesses are hiring. Small business owners and entrepreneurs all over the world are looking for people to help them with their day-to-day tasks and special projects. (Side Note): This blog would not survive without the help of a Virtual Assistant or two. I am here to tell you, it is worth your time learning how to become a Virtual Assistant as well as how to start a Virtual Assistant business that is successful. I personally dish out about $300 per month in Virtual Assistant work. It is definitely worth your time to invest your effort and start a Virtual Assistant business today. Now that you know what a virtual assistant is, here are the basic steps to becoming a Virtual Assistant, also known as a VA. We also look into how to start a Virtual Assistant business that is successful. Decide on your niche – Before you decide to start a Virtual Assistant business, decide on a niche. What type of services do you want to offer? What do you want to be known for? Is there a specific industry you want to work in? Ensure that before you start a Virtual Assistant business, you pick a niche that is profitable. Figure out your ideal client – Who do you want to work with? Decide on the services you’ll offer – Create services that you enjoy doing and your ideal client wants. Figure out what you want to charge – How much money do you want to charge per hour? Make sure to charge enough to cover your expenses, taxes, and health insurance. You can offer services at a project rate, hourly rate, or retainer rate (ongoing services month after month). Name your business – Brainstorm 50 names and pick one you like best. Choose one that is simple and easy to spell. Make sure it’s available on social media sites like Facebook and Twitter. Also, make sure your domain name is available (www.yourbusinessname.com). Choose a business entity and register your business – Most virtual assistant businesses in the U.S. are either a Sole Proprietorship or Limited Liability Corporation. A note from Ladies Make Money: Learn more about the foundational pieces in Billie’s VA’s Guide to Starting a Business. Draft your business policies – Before you actually start a Virtual Assistant business, draft up your business policies. Policies help you develop harmonious working relationships with your clients. You’ll share these policies with your client contractor on your website. For instance: What days and hours do you work? When do you invoice your clients? What does your service include and not include? Write your contract – A contract is created to protect both you and the client and helps enforce your business policies. It confirms that you’re both on the same page and gives the client an opportunity to ask questions before you start working with them. This must absolutely be done before booking your first client as a Virtual Assistant. Before you attempt to start a Virtual Assistant Business be sure to get all your legal papers in order. A note from Ladies Make Money: Figure out your business policies and grab contract templates from Billie’s VA’s Guide to Client Contracts. Create your client processes – You’ll need four client processes: Pre-client, Intake, Service, and Post-service. These processes include all the steps you’ll take from beginning to end and will save you time and energy! Design your client systems – What are the programs, apps, and tools you want to use to streamline your client processes? Get clients and start MAKING MONEY! – Share your new business with everyone, email people you want to work with, offer your service for free for a limited time to gain experience and referrals. In order to even consider becoming a Virtual Assistant, you need to be extremely organized. Your clients will be counting on this from you. A note from Ladies Make Money: Learn more about organizing clients and making money in Billie’s VA’s Guide to Getting Clients. Working from home has many benefits including a flexible schedule, clients you like, doing work you find meaningful, and more. If you’d like to build your own business, maybe becoming a virtual assistant is the way to go! 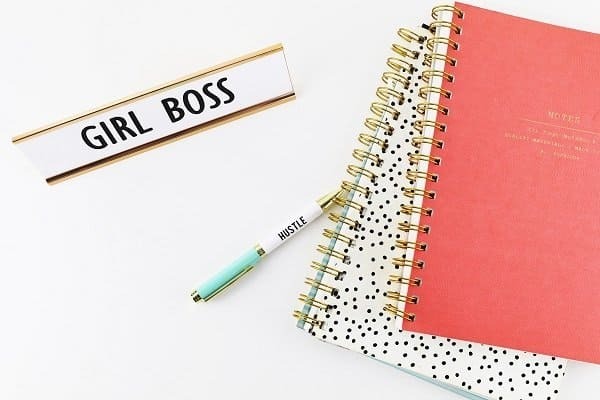 Take the steps outlined above and you could be a #GirlBoss in no time! Amazing guest post from Billie, the creative director behind Desire to Done. 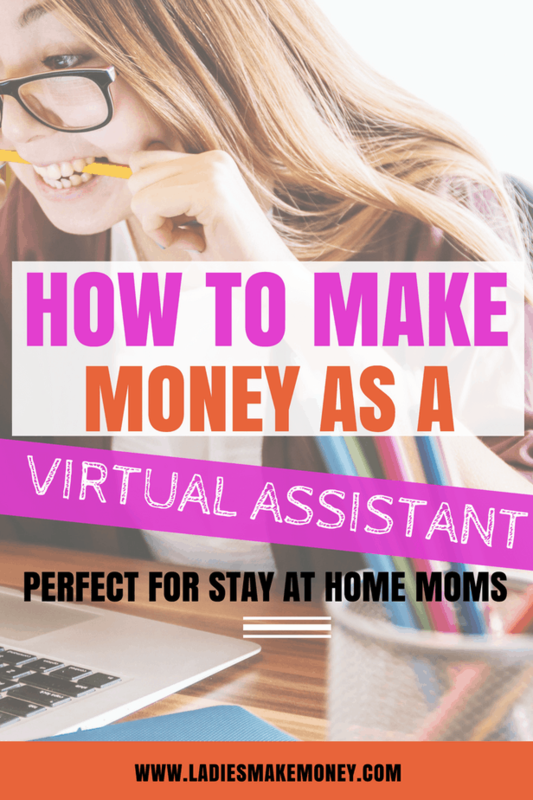 Billie has a lot of amazing tips on her blogs on how to start a Virtual Assistant, what it takes to become a Virtual Assistant, and how to make money from it. 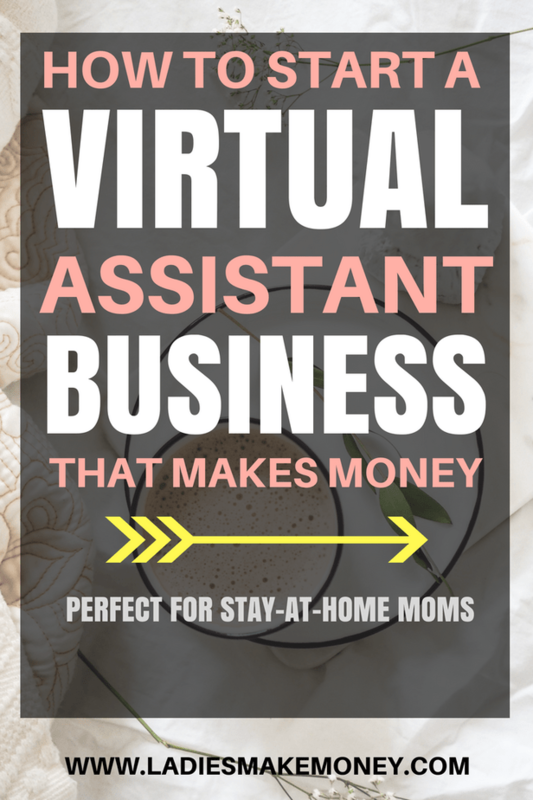 All her tips and tricks on how to start a Virtual Assistant business are extremely valuable. Ready to start a Virtual Assistant Business? Do you already offer virtual assistant services? We would love to hear your comments below. Be sure to pin this post if you loved it. I really love this website. Good post. Thank you very much for sharing . This is awesome! I’m in the midst of building my VA business offering PR services but I feel like I’m stuck in the planning phase! It’s so scary to get started. I’ve been freelance writing for several years now and love it but now that I have a bachelor degree in PR I want to branch out. You should totally go for it. Virtual Assistant businesses are growing every single day. Thank you so much. I am glad you enjoined our blog post on how to start a Virtual Assistant business. I trust we have given you the tools to become a successful Virtual Assistant. Good luck with your journey.